New Product Release: nROADS Amber Products. According to Justin Cooke, Associate Product Manager at SoundOff Signal, nROADS products offer the broadest range of configurations on the market and are customizable allowing users to tailor their lighting solutions to the needs of their job. nROADS™ is the first tri-color family of amber products on the market. nROADS’ mini and mid-size lightbars and beacon solutions provide the broadest range of performance and pricing options within the industry. Snow plows, pickup trucks, utility vehicles, paving equipment, refuse trucks and other equipment each create their own unique warning lighting needs and nROADS meets each need head on. 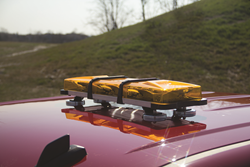 nROADS uses Nexus Technology, the same extremely bright optical technology used in its successful line of law enforcement products, to create a high-performing amber offering designed specifically for the amber market. nROADS products were developed with an all new rugged look that reinforces the sturdy designs of today’s trucks and heavy duty equipment. nROADS is backed with a five-year, no hassle warranty.